Radiation therapy side effects can be roughly divided into 2 groups; Side-effects that make their appearance quickly, called "early" side effects, and later side-effects which show up months afterwards. The difference is that the early radiation side effects become noticeable while treatment is going on. Once the course of radiation therapy has been completed, the "early" side effects fade inside a week or two. On the other hand, "late" radiation therapy side effects only start to show up many months after the course of treatment has ended. Sometimes these late effects are permanent. One example is radiation caries. Radiation caries is basically tooth decay. You tend to get decay cavities in your teeth much more easily than normal, and these cavites get bigger at a faster rate than normal. But first, what causes radiation therapy side effects? It's all down to the effect that radiation has on cells, especially the small blood capillaries and connective tissue cells. Radiation damages a cell's ability to grow and multiply. The effect is greater on cells that are multiplying quickly. Because cancer cells are usually growing much faster than normal cells, they are much more sensitive to radiation. So radiation therapy can knock out cancer cells while leaving normal cells relatively untouched. That's the basic theory. As always, it's not that simple. Different cancers react differently. Some larger cancers that have low oxygen levels at the centre are more resistant to radiation, for example. The most common early radiation side effects are a feeling of general fatigue and skin changes. You start to feel tired, and a lot of patients will start to have a sleep during the day. So long as you take things easy and don't try to do too much during this time, the sensation of fatigue goes away a few weeks after treatment is finished. Your skin over the area that is being treated will gradually become a bit tender during therapy. It's a bit like sunburn. Again, this usually goes away a few weeks after treatment, although sometimes the skin is left with a slightly different texture afterwards. Soreness inside the part of the mouth which is being treated is the most severe side effect of head and neck radiation therapy. This soreness can start about 2 weeks in to treatment and tends to get gradually worse until the treatment is completed. It settles down about 6 - 8 weeks after that. For patients getting radiation treatment twice a day it may be more severe. Don't eat food that can irritate your mouth, such as food with hot spices, potato chips, nuts or crispy pizza crusts. Don't eat or drink anything very hot. Avoid smoking, whether it's cigarettes, cigars or pipes; don't use chewing tobacco. Don't drink anything with alcohol in it. These can all make your sore mouth worse. Try to avoid candy, in fact all snacks that have sugar in them. DO rinse your mouth out very gently with warm salt water every 1 to 2 hours. Try to sip cool water through the day. Now let's look at the late radiation therapy side effects. As I mentioned at the top of the page, radiation treatment to your head and neck can increase your chances of getting cavities. This is called radiation caries. ("Caries" is the word dentists use for tooth decay). The basic problem is that your saliva glands can be affected by the radiation. They make less saliva, and you can end up suffering with a dry mouth. How does a dry mouth give you cavities? Saliva is very important for preventing dental decay - it tends to neutralize any acids from things we eat and drink, and also from the plaque bacteria on our teeth. If there is not enough saliva, acids from our diet and from plaque will not be neutralized, and can attack our teeth. 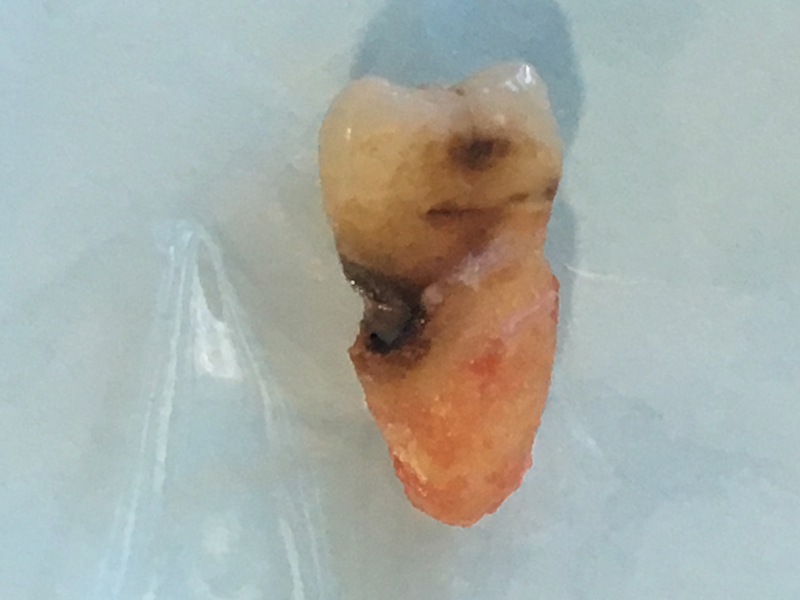 This is how you can suddenly get a bunch of cavities appearing soon after radiation therapy. There are 2 ways of tackling this problem. 1. Before starting radiation treatment, get a dental check-up. Tell your dentist that you are going to have radiation treatment. If you have any teeth that are in poor shape, he may recommend taking them out before your treatment starts. He will also replace any leaking fillings. You should arrange to see the dental hygienist, to get your teeth cleaned. She will show you how to reduce the chances of getting cavities by careful tooth brushing and flossing. 2. During and after radiation therapy, you will need to spend extra time cleaning your teeth as well as you possibly can. Make sure the dental hygienist takes time to show you how to get your teeth really clean at home. This will be very important. You can read about the toothbrushes I recommend at Best Electric Toothbrush. If you have a dry mouth after treatment, you can try some of the remedies at Dry Mouth remedies. Aside from radiation therapy side effects to do with the mouth and teeth, there are also a couple of other issues that come up with any radiation treatment anywhere in the body. The main one is the risk of getting another tumor. We know that radiation can cause cancer. It's obvious that getting radiation to kill or reduce one tumor may result in triggering another tumor years down the line. The risk for most cancers is highest about 5 to 10 years after the radiation, and then it slowly gets less. Some types of cancer take much longer to develop after radiation exposure, and some are diagnosed more than 15 years later. Radiotherapy treatments have improved over the past few decades. The cancers can be targeted more precisely, and this means less damage to nearby, healthy tissues, resulting in fewer side effects. These advances will help to reduce the number of secondary tumors caused by radiation treatment. In anycase, the overall risk is very low, and must be weighed against the benefits of radiation treatment for the primary tumor. In addition, one way of reducing radiation therapy side effects is by using "radioprotective" drugs. These are drugs that are given before radiation treatment to protect healthy tissues in the treatment area. The one most commonly used today is called "amifostine". This drug may be used in people with head and neck cancer to reduce radiation side effects in the mouth. Radiation therapy side effects can be managed and minimized with careful planning, but they cannot be avoided completely. That is the current state of play in the world of radiotherapy side effects.